Updated 4/20/16–I’m pulling this one back up from the archives. I’m ashamed to say that I forgot to mark Raysel’s birthday. (Sorry, Raysel!) It falls on the fourth day of the first month in Renatus’ calendar (March 23 in our calendar)–just three days after the vernal equinox/Renatus’ New Year’s Day. The calendar used in the world of Renatus differs from ours in some ways. Since the people of Renatus, particularly those of Chiyo, are in tune with the rhythms of nature, I wanted to use a calendar system based around natural and astronomical events rather than our own. 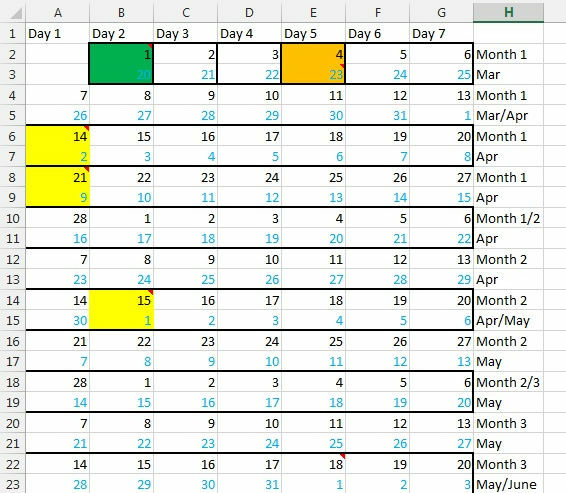 I ended up choosing a system with 13 months consisting of 28 days each (loosely based on the International Fixed Calendar). It’s an imperfect setup since there needs to be an extra day at the end of every year. Occasionally, additional extra days would be needed to allow corrections so that the months remain properly aligned with the solstices and equinoxes. These extra-monthly days are called the New Year’s holidays. They are celebrated between the last day of the 13th month and the first day of the 1st month. The first day of the 1st month falls on the date of the vernal (spring) equinox. This calendar is conveni ent for many reasons. Each date occurs on the same day of the week every month (so the 1st is always on the second day of the week, every month). I want to make sure even small details like the phase of the moon are as consistent as possible throughout the story. Since this calendar also roughly follows the lunar phases, it makes it easier to keep track of what the phase should be at a given time period. I realize that our moon cycle isn’t exactly 28 days, but, while Renatus is intentionally Earth-like, it isn’t necessarily meant to take place on Earth. I also want to accurately keep track of the significant events that take place in the story, both in terms of the relative timing to one another as well as in relation to the seasons. In order to help me track the timing, I constructed a calendar that overlays Renatus’ calendar with our own. I mark various events, holidays, character birthdays etc, by color coding dates and entering specific details in the comments (like you see in the image). Although I’ve created this in great detail for my own reference, I don’t intend for the reader to need to be aware of how the days relate to our own calendar in order to follow the story. There are four major holidays in Renatus, along with numerous minor holidays and festivals that are observed regionally (such as the Masquerade night in Niamh). The major holidays are New Year’s day(s), the Festival of Fans (summer solstice), the Festival of Flames (winter solstice), and King’s Day/New Year’s Day (the first day of the 1st month). I plan to go into more detail on these holidays and how they are celebrated in future posts! I’ll also mark the occasion by posting on character’s birthdays, so keep an eye out to learn when your favorite characters’ birthdays are! Next postNail Polish Sunday #11 and a Book Giveaway!